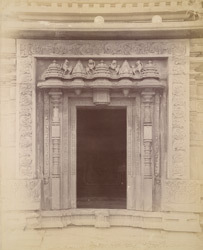 Photograph of a doorway of the Kamalanarayana Temple at Degaon, Belgaum District, taken by Henry Cousens in the 1880s. This Chalukya temple is dated around 1175 from an inscription. It is built on an unusual plan as it has three shrines and the principal one is located inside a long hall which has an open verandah with a sloping roof resting on ten pillars. The shrines are not roofed by superstructures and have elaborately decorated doorways. The doorway of the central shrine incorporates a dedicatory block with a swan, the southern shrine has Sarasvati and the northern shrine Durga or Kali.